King Ja Ja of Opobo by Edward L Cox (The Barbados Museum & Historical Society, 1998). King Jaja of Opobo was reportedly born in Igboland in present day Nigeria in 1821. He was sold as a slave at an early age, but would gain his freedom through his aptitude for business. A successful trader, he eventually founded the state of Opobo and become its king, making Opobo a major exporter of palm oil. 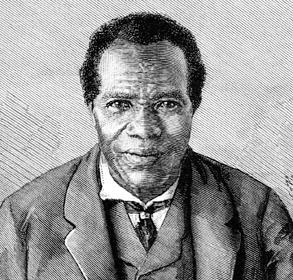 Beginning in the 1880s, disputes between British traders and the state of Opobo escalated to the point where the British sought to get rid of King Jaja. Tricked into attending a meeting to settle these trade disputes, King Jaja was arrested in 1887 when he arrived on board a British ship. He was later taken to present day Accra, Ghana and put on trial in November 1887. He was found guilty, with the punishment of banishment to the Caribbean. On 8 May 1888 King Jaja and members of his family and court left Accra aboard the British ship Icarus for Grenada. There was debate over his final place of banishment, but the Grenadians who came out to welcome him when the ship pulled into the Carenage had hoped that he would at least land on Grenada. It was reported in The Grenada People newspaper that “crowds of boats filled with inquisitive people anxious to see what sort of person the king was, collected about [the Icarus].” The paper continued that “when it was found that Jaja was not to land, much indignation was manifested on all sides, the people apparently having made up their minds to give him a hearty ovation should he have landed.” Later that day the Icarus sailed out of the Carenage en route to St. Vincent where King Jaja began his five-year banishment. He was later moved to Barbados to complete his exile in 1891, but two months later was granted permission to return to Opobo due to his ill health. Unfortunately King Jaja never got to see his Opobo as he died en route.